At a press conference today on the Pope’s Lenten Message, Cardinal Paul Josef Cordes offered his support for Archbishop Charles Chaput’s recent stand against a potential Colorado law. The bill would eradicate Catholic Charities’ ability to ensure its employees follow Catholic beliefs when working on state funded projects. Last week, Chaput objected to a proposed measure before the Colorado legislature which would bar charitable agencies that receive state funding from discrimination on the basis of religion in personnel policies. Chaput argued that such a measure would compromise the Catholic identity of church-run charities, and that he would rather see those charities stop delivering services rather than comply. The cardinal also brought Pope Benedict XVI’s encyclical “Deus Caritas Est” to Chaput’s defense. “The pope’s encyclical was not just put together out of thin air. It was a response to a development in society. Catholic agencies have to be very careful not to lose their liberty, taking money from donors who later try to introduce a mentality that does not correspond to ecclesiastical objectives,” Cordes told the National Catholic Reporter. 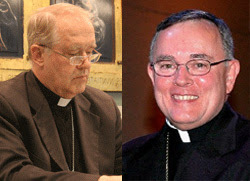 Back in Denver, Colorado, Christopher Rose, the president of Catholic Charities of the Archdiocese of Denver, published a letter to the editor in the January 30 issue of the Denver Catholic Register backing Chaput’s position.